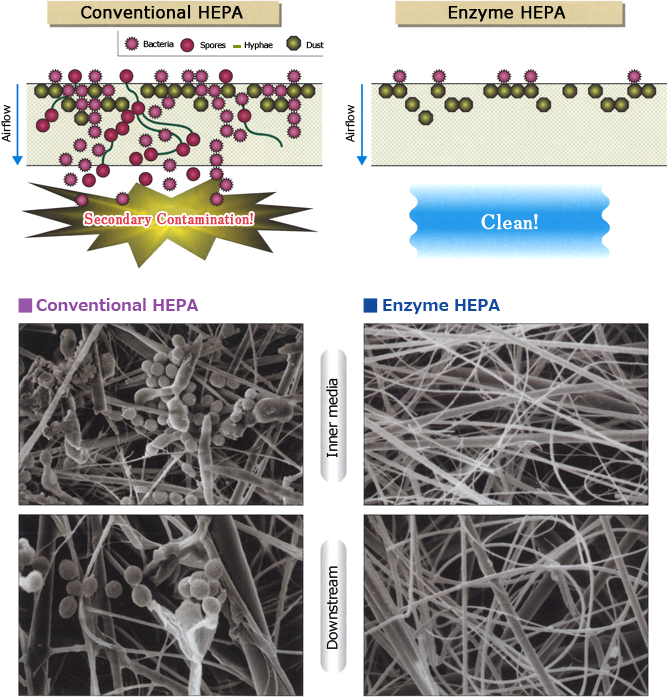 Enzyme HEPA filters can eliminate active bacteria propagation, but conventional HEPA cannot. Enzyme Filters have revolutionized the nature of air cleaners. 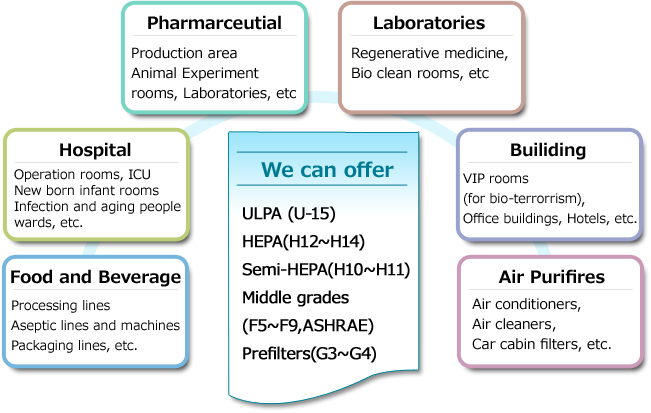 The Enzyme Filter eliminates active bacteria propagation, spore growth and contamination found when conventional HEPA or other types of air filters are used. It is an excellent choice for better air quality in enclosed spaces. The image figure below shows the bactericidal mechanism of the Enzyme Filter. 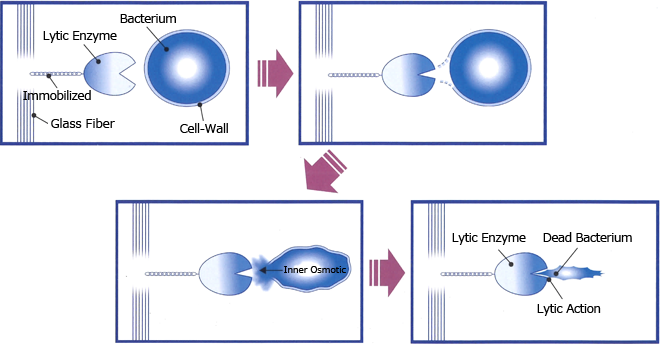 The cell walls of the bacteria have been hydrolyzed by the lytic action of the enzyme, and the cell membranes have been ruptured by inner osmotic pressure. 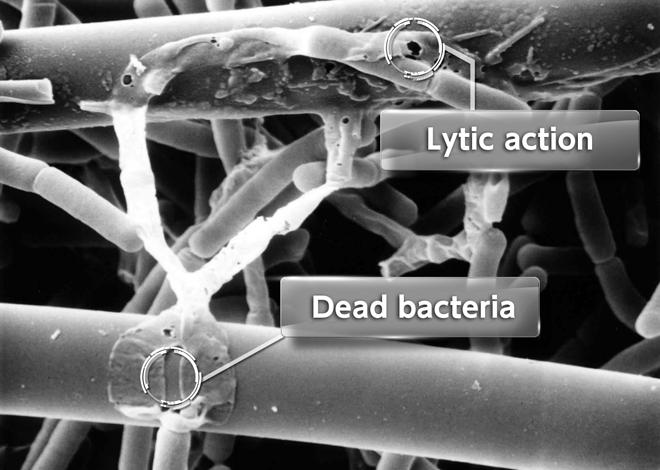 Modified lytic enzyme, a natural substance, is immobilized on the filter fibers by the original technology, preventing perfectly secondary contamination without captured bacteria growth. The enzyme does not scatter from the fibers and is not consumed when it dissolves bacteria. Therefore, the enzyme has a very long lifetime. The Enzyme Filter can be used keeping perfect bactericidal ability until it is clogged with dusts. Viruses may be described as particulate matter which contains nucleic acids (DNA or RNA) and some proteins.They are unable to reproduce on their own, but able to invade into host cells using spikes on the envelope to reproduce their copies. The Enzyme Filter dissolves viral envelopes to render viruses inert. Please visit Nikki-Universal Co., Ltd.'s Website as well. Copyright © from 1997 JGC Trading & Services Co., Ltd. 日揮商事株式会社All rights reserved.